I feel like tuna salad was a staple in everyone’s diet as a child. Canned tuna mixed with mayo and some sort of crunch (pickles or celery) thrown together with cold macaroni or in between two slices of bread. Whichever poison you chose, the stinky, yet delicious classic reigned strong in our youth. I, personally, was more a fan of the macaroni tuna salad than the sandwich. My mom makes a mean tuna salad. Speaking of which, can you make it next time I’m home, Mom? Thanks! That being said, I actually didn’t have many tuna melts growing up, but as I got older they looked more and more appealing. Melty cheese and tuna salad amongst toasty bread? I’ll take it. But, being the “recipe ditcher” that I am (yeah, I hate myself, too), I needed to switch things up a bit. To make it slightly healthier I swapped olive oil for the mayo, added some fresh veggies, and used whole wheat toast. Traditionally, I think people use cheddar or American cheese, but I used swiss–mostly because it’s what I had in the fridge, but party because I like its nutty flavor. Let this sandwich rekindle the flavors of your childhood, with just a kiss of adultery. Start by making the tuna salad. Finely dice the onion and celery. Drain tuna and combine with olive oil, mustard, celery, and onion. Season with salt, pepper, and red pepper flakes to taste. Next toast the bread (I did this in a toaster) and turn on your broiler. 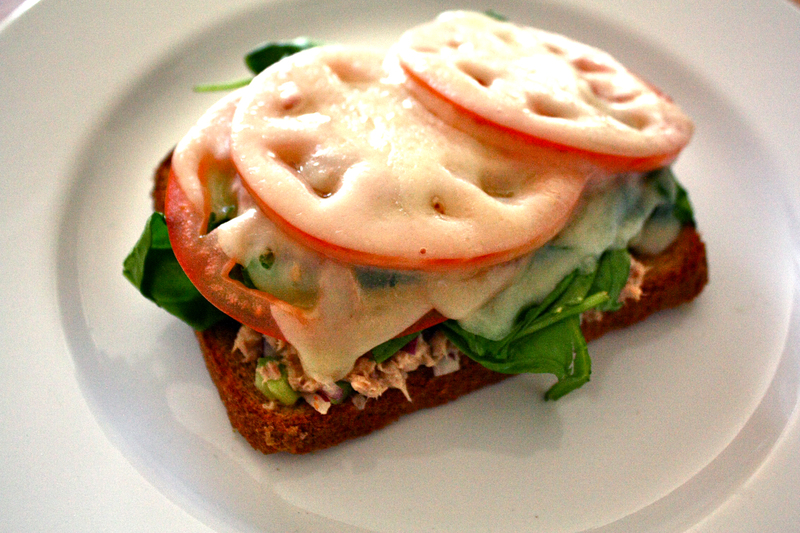 Layer the toast with the tuna salad, spinach, sliced tomato, and cheese. Place under the broiler until cheese is completely melted. Done. I really like your take on a traditional sandwich. Next time I am gonna try your recipe! I have a lot of easy and delicious recipes on my blog. Check them out if you have time. I would appreciate your feedback too!